The Fire Danger Period for Mornington Peninsula Shire commenced at 1:00am on Monday 19th November 2018. 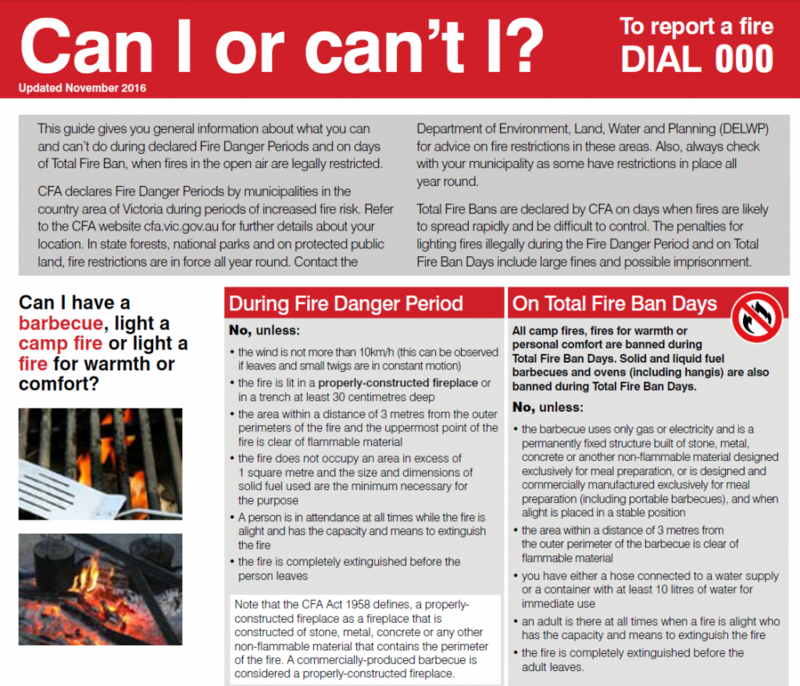 Once the Fire Danger Period has been declared, fire restrictions come into force. This means you cannot light a fire in the open air unless you have a permit or comply with certain requirements. If you don’t obtain a permit, you could be breaking the law and may be prosecuted. When can I burn off in Mount Eliza? During the Fire Danger Period, you are not permitted to burn off unless you have a permit from Mornington Peninsula Shire Council. More information about CFA’s Fire Danger Rating can be found here. Mt Eliza is within the Central District. For total fire ban and fire danger ratings for each day, please click here. For the current Fire Danger rating, please visit our homepage, or CFA’s website.